Did you know that it’s possible to earn 1.8% cash back on every purchase you make? How about get complimentary access to concierge services and travel insurance when you go abroad? Well, the Citizens Bank Cash Back Plus® World Mastercard® credit card can offer you all this and more. There’s no limit to how much cash back you can receive, and with no enrollments, rotating categories or transaction fees, the Citizens Bank Cash Back Plus® World Mastercard® Credit Card comes in highly recommended. Read on to find out more about the benefits of this World Mastercard credit card and how you can apply today. First of all, you can enjoy zero foreign transaction fees when you travel abroad. When you consider how much you normally spend on credit and debit card fees whilst overseas, this reason alone is worth applying for the credit card. On the topic of travel, Citizens Bank has got you covered should you get into an accident or face trip interruption or cancelation. They’ll also throw in complimentary concierge services and a 10% discount on rental homes in select major cities. Love shopping? With the Citizens Bank cash back credit card you can shop to your heart’s content (responsibly), confident that you have zero liability protection against unauthorized purchases. The card is also chip-enabled, adding an extra level of security. When you receive your Citizens Bank credit card, connect it with Apple Pay for even more convenience at the check-out counter. And remember, with every eligible purchase you make, you’ll earn 1.8% unlimited cash back into your pocket. 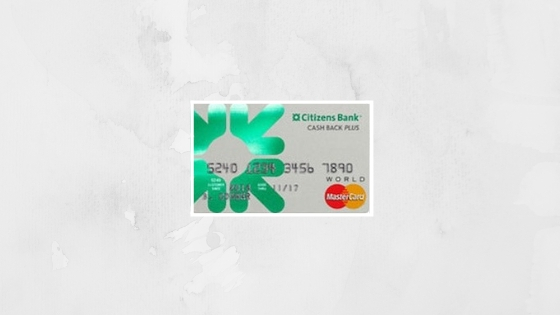 To be eligible for the Citizens Bank Cash Back World Mastercard, you must be 18 years or older with a social security number and a driver’s license or state ID. You must also be able to show proof of a stable income in the form of pay-slips or tax documents. It’s very straightforward to apply for a Citizens Bank credit card. Simply visit the Citizens Bank website and fill out the online application form. Note that you will be asked to provide your personal information, including your address, contact number and income details. To ensure that your private and personal information remains secure and confidential, the bank uses the highest form of Internet security technology. After you submit your application, a confirmation page will appear on your screen. You will hear back shortly regarding whether or not your application has been deemed successful. Overall, the Citizens Bank Cash Back Plus® World Mastercard® Credit Card offers plenty of worthwhile perks and privileges to those who love to travel and shop. If this is you, visit the Citizens Bank website and apply now to begin enjoying a world of credit card benefits.